Vinny Pasceri, the Aero Program Manager for Windows Vista, has the daunting task of oversighting the user experience development project. Many people and especially Microsoft enthusiasts do not understand why Windows has so many legacy and conflicting user experience elements, and even why Microsoft will fail to address those issues in Windows Vista. Having said that, Microsoft designers are unofficially committed to redesign most of the icons in Windows to the new Aero interface standards. Now, with RTM just around the corner, how are they doing? Remember last time, I recorded 4562 icons in Windows Vista? Today I took the time to extract all the icons from the Windows Vista build 5728 resource files, and identified all the 256*256 icons. 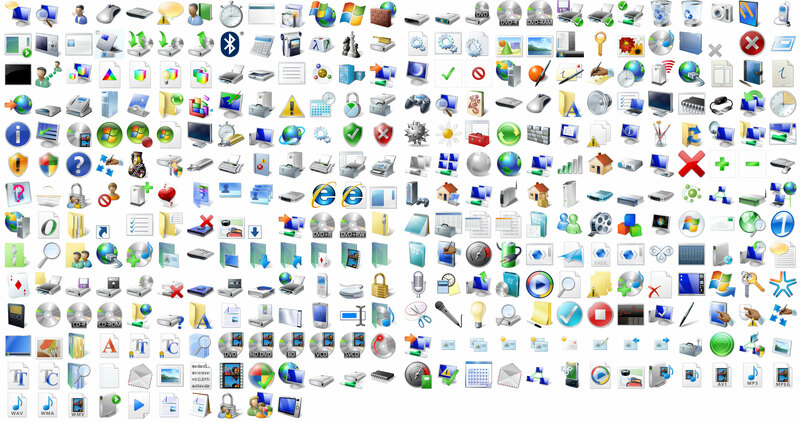 I’m happy to report there are nearly 350 new high-resolution icons in Windows Vista now. Have a look for yourself. Note: icon size reduced for ease of viewing. Download all the 256*256 icons in a ZIP (24.7MB) file for your own viewing pleasure and any other pleasures you may get out of high-resolution icons. Or, you might prefer the PNG version (ZIP, 14.9MB) for easy viewing. And check this out, the fidelity and attention-to-detail for the Journal icon is amazing. Leather good enough to eat! Windows Vista is looking better everyday. Even it won’t be the perfect operating system, or reach the level of ‘legacy-less’ in Mac OS X, hats off to the Microsoft designers. Addition: Yes. I know Mac OSX 10.5 Leopard is going to have 512*512 icons, and they look amazing. But I’m only focusing on Windows for this post. Okay, I’m convinced. You’re a mind reader. I was just going to request that you did this since you took time to extract all the ico’s. You’re great, Keep up the good work! I love the fountain pen beside the Journal, the fidelity is just amazing. Some icons still can’t make it to the 256 x 256 size, you can find those in the Windows folder. Surprisingly Office 2007 icons do no support the 256 x 256 size either. So beautiful especially the lickable leather! I only wish the icons were more consistent though it is a tremendous effort MS has put into them so far! How do I add these icons, i mean how do i use these icons in windows xp. hi i have downloaded it and how its just an pdf page there are no icons. the icons are only like images in pdf file. what the heck should i do now?? Gracias, es una buena utilidad. I want to know how decrease resolution of these icons in ICO format, or how to turn the PNG picture of icons into ICO format? Which of programs can do that? 1.open this website http://www.askvg.com/vistavg-icon-pack-for-windows and click on download vista vg icon pack under the icons image. 3.Open “VistaVG.iconpackage” file in Icon Packager and Apply it. HOw do you use these. Can they affect the computer. I had downloaded these from a different website before and they dident work. So i hope these work. thanks. Excelente! Me ajudou muito… Obrigado! THANKS man your awesome! great work! Thank you, I was looking for the Official Windows Vista icons a long time. And never buy Windows Vista until 2008, there are just to many bugs. Thanks for the download!! This is the only place on the internet where i can find downloadable vista icons. Thanks again…but how do you apply them?? It is very useful to convert ICO PNG via drag-n-drop. Do I have to replace EACH single icon at a time ?? Cant I just replace them all simultaneously ?? They got some great vista icons at virtuallink. You can find them in their freeware section. Anyone found any good flag icons in the vista style? can someone please explain to me hot to install these icons because i downloaded it and dont know what to do next…:( pleasee someone help me! i smell simply greatness in this…great work, I ve been searching for them for a long time… tahnku very much…. Man! Thanks for doing this. I had been searching on Google for these. Appreciate it a bunch! Thank you very much. I’m keeping XP SP2 in use with WindowBlinds 5.5 and IconPackager and this is a great way to give an even better look with out the RAM hogging Vista whale. Great work! Where’s the blank file icon at? Thanks for ripping the icons! You have icons that can’t be found elsewhere (like the sound/volume icon). I needed these!! Wooow, very nice, thoug I can’t find the its i want. There are so much icons, that I can’t found the names! It would be good if you put the names or make a TuneUp icons pack. howw do i use the icons on my windows XP computer? Nice icons. But how do you use them? Hi this very good nice.. icons..
Nice icons but Windows XP i better!! nice but how can i use that in win xp pro??? Oh, so YOU’RE the guy to blame then. Ever think about what purpose icons actually serve? They aren’t there to show the graphics capabilities of the latest operating system nor the skills and sensibilities of their designer. It is a GOOD thing to use the exact same icons year after year. Why? Because it allows people to find what they are looking for INSTANTLY, without having to even think about it. Now, with Vista, we need to relearn all that. Notice how it takes a second or so longer to recognize all these updated versions of old familiar icons. Sure, it’s not shaving days out of our lives, but it is a tangible and completely unnecessary nuisance. I don’t care if the icon for Word or Control Panel hasn’t changed since ’95. I just want to find what I need and get my work done. I personally don’t care about Icons, but typically its good eye candy for sales. If people see a nice looking interface and good icons to polish it off, it’ll improve the chance of a sale. Honestly, after a day or two of using the new icons, it barely takes any time to realize “Oh, this is Photoshop” or word or whatever program it may be. thank u for this …. thanks for these cool free images. what software was used to take the icons from the .dll’s or .exe’s ? Can you please tell me the name and purpose of the icon in the third row from the left, third from the top? Hmmm icons tooooooo good nice !!!! if you want to increase Your Window Performance or Computer and get some free Download PC optimization software from TunePRO360. I used this TunePRO360 optimization software and got satisfied performance.